Creating a first good impression of dentistry at a young age will creates great patients for life! 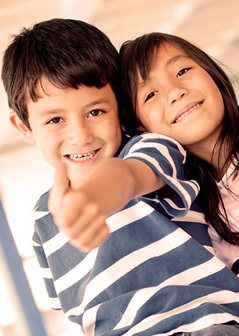 At Guillermo & Silvia Donan, DDS, we provide caring and comfortable dental treatment with the most current technology to diagnose and treat any dental-related problem in our child-friendly Fresno, CA facility. Drs. Guillermo and Silvia Donan see patients as young as three years old. It is important that your child’s newly-erupted teeth receive proper dental care and benefit from proper oral hygiene habits right from the beginning. Prevention is a key element in our practice; the best ways to prevent cavities or dental problems is to monitor our patients closely and educate them every six months. Healthy oral hygiene habits start at home! Brushing can be fun, and your child should brush as soon as the first tooth arrives. When your baby’s tooth erupts, brush the tooth with a soft-bristled toothbrush and a pea-sized amount of toothpaste. For children younger than two, do not use fluoride toothpaste unless advised to do so by Dr. Donan or another healthcare professional. We suggest reviewing proper tooth brushing procedures with your child. Flossing is also a part of good oral hygiene habits; Drs. Guillermo and Silvia Donan will discuss with you the right time to start flossing. If you notice signs of decay, contact our office immediately. Tooth decay is caused by sugars left in your mouth that turn into an acid, which can break down your teeth. Children are at high risk for tooth decay for a simple reason: many children and adolescents do not practice regular, good oral hygiene habits. Proper brushing and flossing routines combined with regular dental visits with Dr. Donan and our hygiene team help keep tooth decay away. Your child should visit our Fresno dental office every six months for regular dental cleanings and checkups. We recommend fluoride treatments twice a year along with cleanings to keep teeth their strongest. Tooth sealants are also recommended because they “seal” the deep grooves in your child’s teeth, preventing decay from forming in these hard-to-reach areas. Sealants last for several years, but will be monitored at your child’s regular checkups to our Fresno, CA dental office.